Ally - a.k.a. "Ally Pooh Pooh"
Hello! 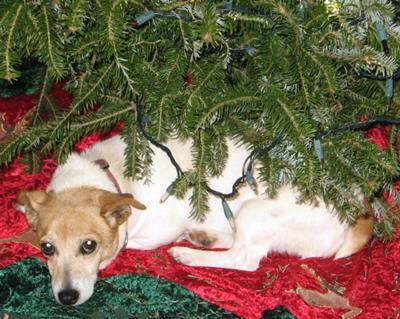 Ally is a 12 year old female Jack Russell who we adopted from a rescue shelter home when she was just 10 months. She never got to have a litter and she came home to a home with a 1 year old male Jack Russell and no children. That dominant male never diminished her determination to be what my husband calls "BOSS LADY"! Ally was 5 when our first child was born and she adjusted quickly to babies and chaos with great ease. But, she alsways managed to stay right under my feet - I'm Mama and her very favorite! Our family has since grown to 4 children now all under the age of 8 along with a 2 year old Maltese terrier "Teddy"(who replaced our old Jack Russell) and our newest addition- a 1 year rescue shelter Jack Russell we adopted this week "Hershey." We will submit Hershey later. Ally can sing with a piercing pitch!, play dead, roll over and likes to crawl to you for fun and a backrub. At Christmas, she spends all her time sleeping under the tree and she barks incessantly when she sees us bringing it in each year! We call her Ally Pooh Pooh because she is very shy when company comes over. Ally slouches her body over and her head down on the floor and will not be herself until everything is back to normal. So funny! So we always say she is being a pooh pooh dog -sort of similar to a party pooper! We love her and hope she lives forever, but for now we know she would make a GREAT JACK OF THE MONTH! Comments for Ally - a.k.a. "Ally Pooh Pooh"
What a wonderful and very sweet story. I love her nickname. Life without a JRT/mix would be a life without sunshine and laughter! Love them all and GOD bless you and your JRT's/mixes!